This comic obviously works best if you read Xavier's part in Patrick Stewart's voice. Although I'm guessing you did that automatically. 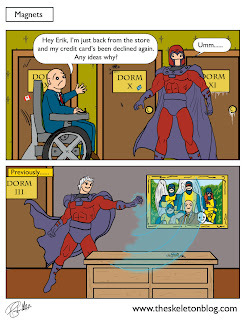 Magneto is a douche who ran a group called 'The Brotherhood of Evil Mutants'. This is the worst possible name for a terrorist organisation. When you put the word evil in the title of your group you're probs gonna attract a certain shady individual.